Before passing the Bar, Attorney Rhodes worked as a paralegal for 7 years handling Family Law Cases. 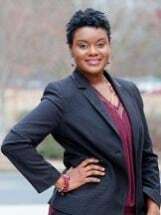 Attorney Walls worked for Georgia Law Center for the Homeless in Atlanta for over three years where she assisted clients with receiving disability, housing, birth certificates, divorces, custody and child support before deciding to pursue her own law office after passing the Bar in 2010. Throughout her childhood Attorney Rhodes knew that she wanted to be an attorney. She realized that at times the justice system does not always appear to be "just". It is Attorney Rhodes passion to steer the system of justice to the right path in assuring that her clients receive justice and a chance to have their voice heard in the legal system. Attorney Rhodes makes time to speak with her clients and return their calls within 24 hours or less. Attorney Rhodes feels that is it important to treat every client with respect and to give each client's case the adequate competent representation that it deserves. Attorney Walls is a family law and Personal Injury attorney in Georgia who understands how important her work is to her clients. She has been divorced and has two young children of her own and can personally relate to the civil process from a personal and professional view. She loves inspirational quotes and poems, her favorite poem is “DON’T’ QUIT” because it's uplifting and a reminder to those who are experiencing turmoil to not give up no matter how tough times may become.